That thought kept running through her mind as the couple made their way down the aisle. Her excitement wouldn’t let the grin leave her face. She almost spoke aloud, “how could I be so blessed to be marrying this man?” He was handsome, yet rugged. She felt completely safe knowing he would now be her protector and partner for life. It began one afternoon when he came home from work. The first words from his mouth were, “there’s dust above the door mantle.” But he didn’t stop there. He inquired, “Do you intend to mop the kitchen floor today?” And then added, “By the way, I prefer my shirts to be starched, not just ironed.” “And while we’re on this topic, I don’t particularly care for the detergent you’re using.” Before long he had brought to her attention her making of the bed, the seasonings she cooked with, and the way she brushed her hair. He seemed to go on and on and on with an endless list of failures on her part. She remembered her initial thoughts of this man at their wedding. She was absolutely right in her assessment of him. But something had changed. On the day of their wedding, she thought of those words with joy and excitement. But now, she thought once again, “I’ve married Mr. Perfect” with despair and hopelessness of ever meeting his demands. I wonder how many believers have experienced this same despair in their walk with their Lord and Savior, Jesus Christ? I’ve been there and I suspect many others have also. But not because we have to. Instead, because as Paul teaches, there is a great misunderstanding of the law in relation to grace. We step into the faith and the first thing we’re hit with is a list of do’s and do not’s. Most items on the checklist are legitimate principles of the faith, but the method is all wrong. It sends a signal that being in Christ equates with rule-keeping. Paul engaged this error often, even to the believers at Rome. In the seventh chapter of his letter, Paul uses an illustration of the marriage laws of his day to convey his thought. When a couple was married, they were joined until death. At least until the death of one party. 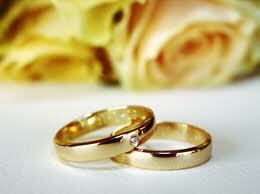 If the husband or wife were to pass away, then the other was free to remarry. He is basically teaching that everyone is accountable to God’s law, His standard of holiness and righteousness. No matter how much we may not want to be married to God’s perfect law, its ring is permanently attached to our left hand. What’s the answer according to Paul? One party must die. But it will not be the law. Remember Jesus’ words… not one jot or tittle. The law cannot die, it’s perfect and holy and just. So if the law cannot die, then only one option remains… we must die. That’s the purpose of the sixth chapter of Romans. For believers, Paul explains, Jesus carried our sin nature to the cross… and it was crucified with Him! The words, “I am crucified with Christ” should sound familiar, for it is the battle cry of Paul often in his writings. Paul wants his readers to understand that the law was given to make sinners aware of their sin, a school teacher of sorts. The law is a shadowy revelation of God’s character, but His perfect character is manifested in His Son. We desire to be obedient to the law, but not out of fear… instead, out of love for our Lord, who we want to be a mirrored image of. This entry was posted in WordPosts and tagged Christianity, crucified, faith, God, grace, Jesus, law, love, marriage. Bookmark the permalink. Hi Mike I thought it would be a good idea to share with you and a few others how I came to understand God’s Truth instead of trusting in my own understanding or others. After coming to real heart repentance but because of so much conflicting teaching I felt very unsure about what was Truth and so had doubts. One day as I was reading the Scriptures a verse touched my heart, Mark 9:24 some Christians call this a Rhema Scripture, it said… that a man’s son was in need of healing and Jesus asked him do you believe, the man answered yes I believe but please help my unbelief and so I also asked Jesus to help my unbelief. Not long after this realizing I was very confused because of the conflicting teaching in the Churches and by Theologians and Evangelists even those who had a high profile and yes they all claimed what they believed was True but what they taught was different which means some of them were trusting in their own worldly understanding or what they had been taught instead of God’s Truth. I knew this to be True because The Holy Spirit does not say one thing to one person and something different to someone else when it contradicts and as I knew we are not to agree to disagree but to take our difference to God and he will show us who is in error because we are to have the same focus and to be of one mind and purpose, it confused me greatly because how could they all have the mind of Christ and also be in conflict which was shown by their division . I prayed to God for His help again and He gave me another Rhema Scripture James1:5-8 I asked in Faith for God’s wisdom and I have no doubts that I have received it and that it is growing in my heart in knowledge and insight and will continue to do so as He perfects me in His Love to conform me to the image of His Son. What God has shared with me He has confirmed in His written word by His Living Word but as I said before I am still learning but I know without a doubt what God has already shown me His Truth and I don’t doubt it …. Jesus tells us we don’t have because we don’t ask with Faith believing what He says He will do and I found this is very True. Why don’t they believe because they don’t ask! The first part makes me appreciate being single where I don’t feel like there’s a list of obligations I have to meet to stand up to perfection, but as far as relating to Jesus on the terms, I often feel like the clay, that He can use me and change me and that He has given me enough grace, strength, and favor to carry out the law written on my heart. Thanks for reading friend, God bless. Here is a good correlation to this post. The funny thing though….it’s today’s post. God works in mysterious ways. Yes He does, Jeffrey. God bless. Excellent note, M.T. Thanks for sharing! Thanks Carley, I really appreciate your encouragement. God bless.